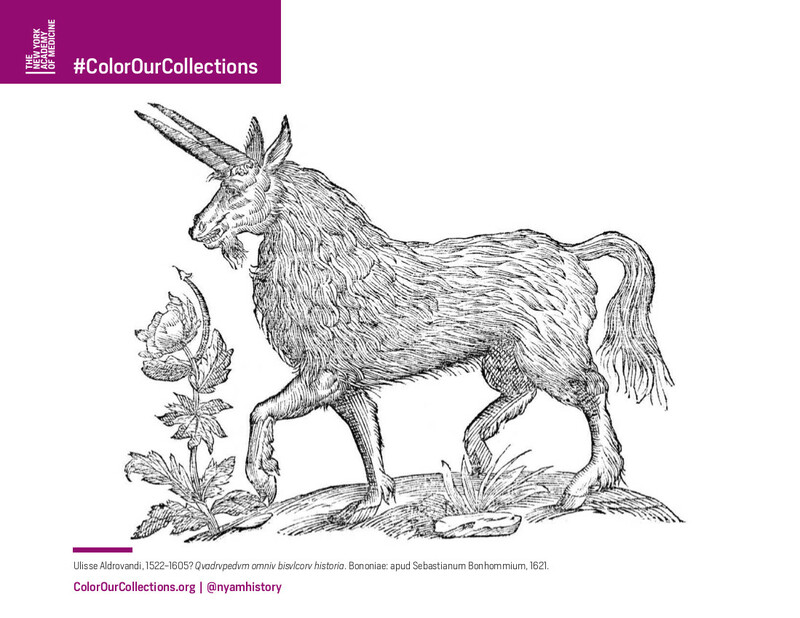 It’s the fourth day of #ColorOurCollections, a week-long special collections coloring fest we’ve organized on social media. Check out all the coloring books at colorourcollections.org. A set of charming four-footed beasts from the quadrupeds volume of Ulisse Aldrovandi’s (1522-1605) multi-volume natural history encyclopedia is our choice for today’s coloring sheets. Aldrovandi grew up in Bologna as the privileged son of a noble family. His father, Teseo Aldrovandi, served as secretary for the Senate of Bologna and his mother was a first cousin of Pope Gregory XIII. From an early age, Aldrovandi displayed a restless intelligence, studying mathematics, law and philosophy before finally earning a degree in medicine and philosophy from the University of Padua in 1553. By the time he earned his degree, Aldrovandi had already developed a passionate interest in natural history. A popular teacher, he taught philosophy and other subjects at the University of Bologna before he was appointed the first professor of natural sciences in 1561. Aldrovandi’s interest was sparked by personal encounters with other major figures in the world of 16th century natural history, including the ichthyologist Guillaume Rondelet and the botanist Luca Ghini. While Ghini failed in his attempts to garner support for the establishment of a botanical garden in Bologna, Aldrovandi was successful, founding the garden with the support of the Senate in 1568 and serving as its director for almost 40 years. He also travelled widely, often with students, to collect plants and natural history specimens. Over the course of his lifetime, Aldrovandi assembled a natural history museum of 18,000 specimens, as well as an extensive herbarium. Only four of the thirteen volumes of his magisterial Storia Naturale were published during his lifetime; the others appeared posthumously over a period of decades. He left the museum collections, his library, his unpublished manuscripts, drawings, water colors and the wood blocks that were meant to be used to illustrate the encyclopedia volumes to the city of Bologna when he died. A portion of the specimen collections can be visited today in the Istituto delle scienze at the Palazzo Poggi, while the manuscripts, watercolors, and wood blocks are available for study in the library at the University of Bologna. If you like Aldrovandi’s majestic beasts, you’ll love the following coloring pages from our participating institutions. We’re mesmerized by Dittrick Medical History Center‘s beautiful Anatomy of an Horse (1683) by Andrew Snape. Enjoy coloring the many details of University of Strathclyde Glasgow‘s regal lion from Michael Maire’s Atalanta Fugiens (1618). Finally, here is the legendary manticore for your coloring delight. 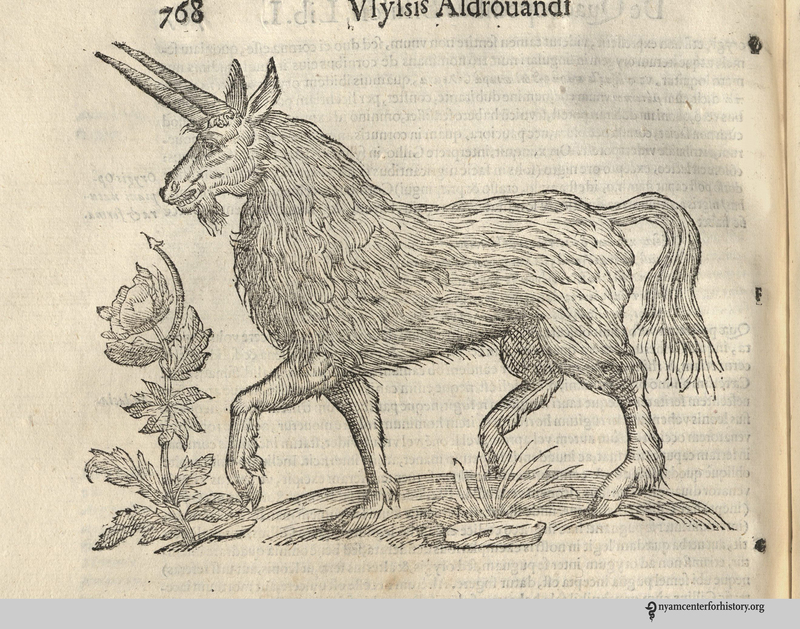 The Donald F. and Mildred Topp Othmer Library of Chemical History adds a bit of whimsy with Historie of foure-footed beastes(1658) by Edward Topsell. Check back in tomorrow for the last day of #ColorOurCollections! This entry was posted in Collections, Digital publishing, Events and tagged #ColorOurCollections, coloring, coloring book by nyamhistmed. Bookmark the permalink.